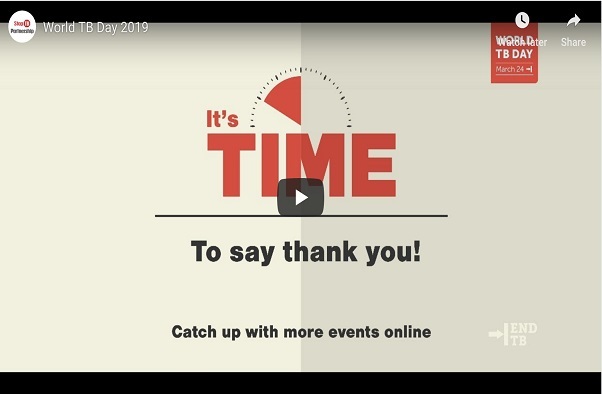 WORLD TB DAY 2019 IT'S TIME TO THANK YOU! FINDING THE MISSING PEOPLE WITH TB - HOW CAN DRUG SALES DATA HELP? World TB Day soon! Let’s tell EVERYONE! 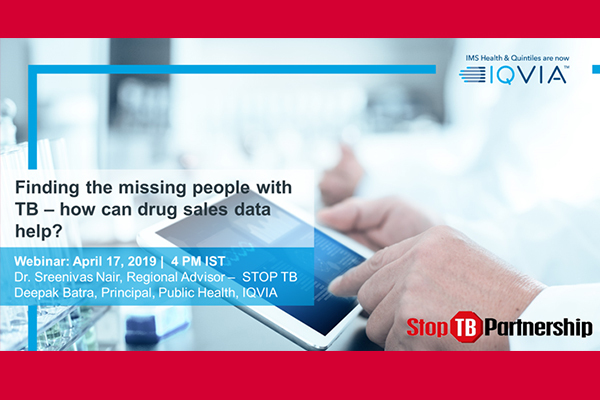 11 April - Free Webinar 17th April - Finding the missing people with TB - How can drug... Free Webinar 17th April - Finding the missing people with TB - How can drug sales data help? It is with profound sadness and regret that we learned of the recent passing of Dean Lewis. Our deepest condolences go out to his family. 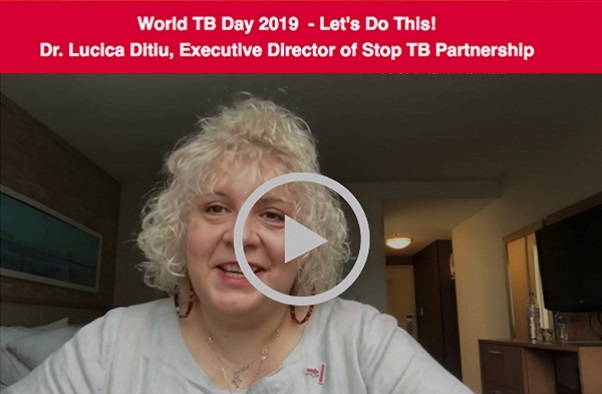 13 March - WORLD TB DAY 2019 - IT'S NEARLY TIME! WORLD TB DAY 2019 - IT'S NEARLY TIME! It’s not what we say today about supporting women and girls, it’s about what we do in the remaining 364 days to truly empower them! Today is Zero Discrimination Day. Take a moment to consider the plight of millions of people and their families around the world who face unjust or prejudicial treatment in their everyday lives. During its 31st Board Meeting this January in Geneva, the Stop TB Partnership Board opened the nomination process for a new Chairperson of the Board. 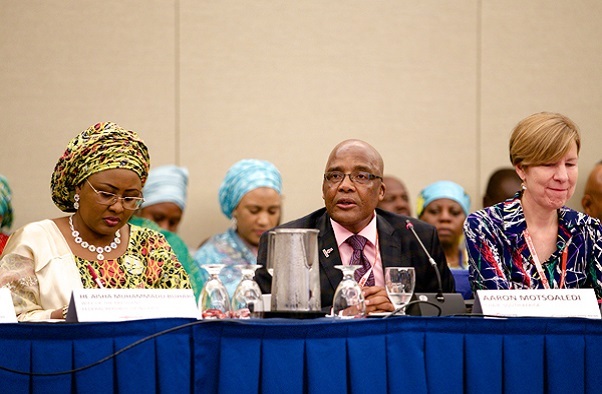 World TB Day, March 24th, 2019, is the first significant moment after the United Nations High-Level Meeting (UNHLM) on TB. IT’S TIME for the TB Community to come together and unite towards achieving the UN Political Declaration on TB targets. 13 February - TB FUNDING UP FOR GRABS! TB FUNDING UP FOR GRABS! Spring is approaching, and IT’s TIME to push harder and bolder for visibility, actions, and funding to end TB. As World TB Day is coming closer, we are continuing with the now famous Stop TB Partnership Valentine’s Day social media effort.Happy Valentin'es Day to all. Last week at its first meeting since the United Nations High-Level Meeting on tuberculosis (UNHLM on TB), the Stop TB Partnership Board made a number of critical decisions to support bold and immediate actions towards reaching the commitments and targets set forth in the UN Political Declaration on TB. The Stop TB Partnership holds its 31st Board Meeting next week in Geneva on 29 and 30 January to review achievements and challenges of the last 12 months and intensify efforts to get the world on track to end TB by 2030. The Stop TB Partnership’s Executive Director, Lucica Ditiu, along with the Strategic Initiatives and Innovative Financing’s Team Leader Jacqueline Huh, have been formally invited to The World Economic Forum’s (WEF) Annual Meeting starting Monday 21st January in Davos, Switzerland. This year we MUST make things happen! We have the targets and milestones clearly defined by the 2030 SDGs, END TB Strategy, UNHLM on TB, The GF/StopTB/WHO "FIND.TREAT.ALL" Joint Initiative and The Global Plan to end TB 2016-2020 - so, let’s do it! TB REACH’s Independent M&E Team met in Geneva on 11 and 12 December 2018 to evaluate progress of TB REACH grantees in the current waves. Partners and stakeholders came together in a workshop in Seoul to discuss the End TB Strategy Pillar 2 in the Western Pacific Region from 11 - 13 December 2018. Earlier this year Andhra Pradesh, home to 50 million people, was prestigiously recognized by the Indian Ministry of Health as the leading state in the battle against TB. Civil Society, communities, people affected by TB, technical partners and stakeholders discussed in Geneva how to use accountability to turn the UN High-Level Meeting on TB targets and commitments into results. This newsletter is dedicated explicitly to the latest progress made in the 13 priority countries of the Strategic Initiative and will be issued quarterly. The Global Fund (GF) led the 1st Executive High Impact Asia TB Regional Meeting brought together NTP Managers, stakeholders, implementers and partners from nine countries which jointly receive half of all TB funding from GF in the effort to accelerate the finding missing people with TB and achieve the ambitious national targets outlined in the UN Political Declaration on TB. Key stakeholders and partners strategized in Benoni, South Africa to plan a comprehensive response to gender and human rights-related barriers in HIV and TB. Twenty countries from Eastern Europe and Central Asia signed the "Minsk Statement of the Ministries of Health of Eastern Europe and Central Asia Countries on Expanding Access to Affordable and Quality Assured Medicines and Diagnostic Technologies." 14 November - IT'S TIME... TO GET READY FOR WORLD TB DAY 2019! 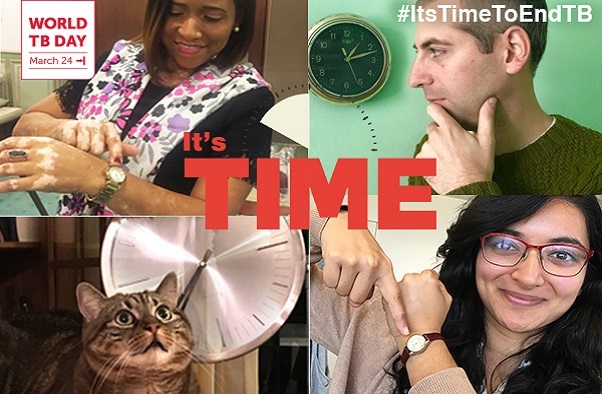 IT'S TIME... TO GET READY FOR WORLD TB DAY 2019! We set goals to fight TB globally. We grant funds to reach and treat people living with TB. We strive to raise the profile and understanding of TB. We bring the voice of TB communities to the fore. We procure drugs and diagnostics. We work together with our partners to create a world without TB. We are the Stop TB Partnership.